Friedman Fine Art offers the finest selection from a collection of historical and contemporary photographs taken by Chicago photographers. The State of Illinois Building is one of Chicago’s most popular sites for concerts, fundraisers, and other special events. The building features an 600-seat Assembly Hall Auditorium, an art gallery, 3 floors of restaurants and shops, and 13 floors of balconies. Located at 100 W. Randolph Street in the Loop, it also houses offices of the State of Illinois. Designed by Murphy/Helmut Jahn, the building opened in May 1985 as the State of Illinois Center, and was renamed in 1993 to honor former Illinois Governor James R. Thompson. The building contains glass elevator shafts, glass-paneled walls and ceiling, and marble floors. Instead of insulated glass, which was expensive at the time, non-insulated glass panels was used, causing the need for a more air conditioning and heating during the seasons. 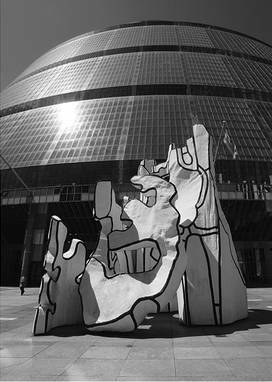 In front of the Thompson Center is a sculpture, Monument With Standing Beast, by Jean Dubuffet. Standing 29 feet, the white fiberglass work of art has been perceived as a tree, standing animal, or architectural form. It was unveiled on November 28, 1984, funded under the State of Illinois Art-in-Architecture Program. Tunnels of the Chicago Pedway enter the buildings food-court concourse, taking people from 203 North LaSalle Street, the Chicago Title and Trust Company and Chicago City Hall. For more information on this collection and how to purchase photographs, contact Loren Friedman at info@friedmanfineart.net.